The ORIGINAL- don't be fooled by substitutes!! 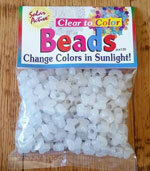 SolarActive beads change colors for years! Beads for Jewelry Crafts and UV Awareness craft projects. Use pony beads energy beads and jewelry making beads to create bracelets fun scrunchies sock toppers key holders and decorations of all kinds! 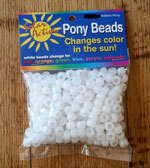 8 Pack SolarActive Color Changing Pony Beads: 8 Colors, 144 Per Pack!